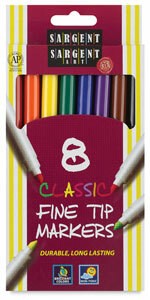 Great for school, home, or office, these durable markers feature a high-quality felt tip and come in a variety of vibrant, long-lasting colors. They are non-toxic, with a child-safe vented cap, making them ideal for smaller children to use. This set includes one each of Black, Blue, Brown, Green, Orange, Red, Violet, and Yellow.